This safari takes you to three of Botswana’s star conservation areas. You’ll begin in the Central Kalahari Game Reserve with its red sand dunes, salt pans, open plains and big skies. This is the second largest game reserve in the world, a vast 52,800 square kilometres. From the arid or semi-arid Kalahari, you’ll fly to a completely different world. In the Okavango Delta you’ll get a chance to enjoy game drives on land, but also to pole through the permanent waterways in a mokoro (dug-out canoe) ride on the lookout for elephant, hippo and a bounty of birds both migratory and resident. The Kwando Linyanti wetlands is the last of the three wilderness areas on your journey. It’s a world of papyrus and reed swamps, grasslands and riverine forests, and home to elephant, lion, leopard, wild dog, zebra and giraffe. This safari is best enjoyed during the green season (from November to March), where the true magic of Botswana's greenery can be felt. You can expect plenty of newborn animals and reductions in safari package costs. Welcome to Maun airport! This is the gateway to your Botswana safari. 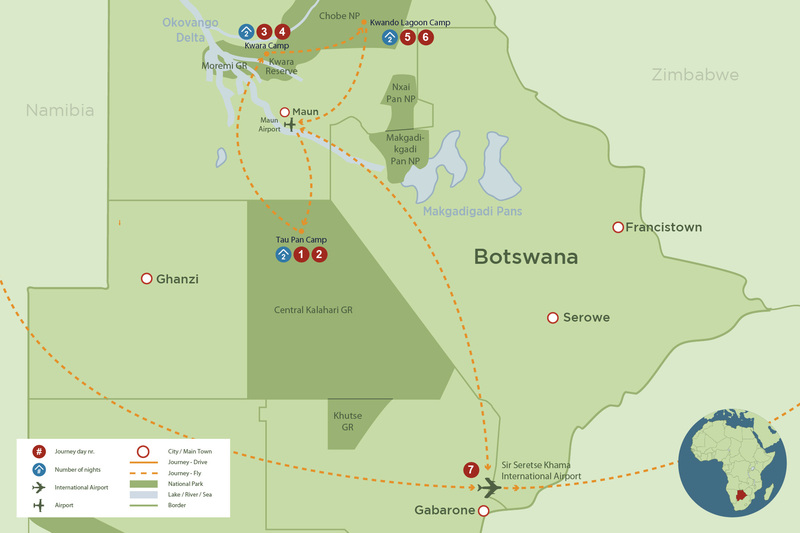 You'll be transferred via short flight to the Tau Pan Camp in the Central Kalahari Game Reserve. This reserve is the largest and least visited reserve in the world. Modern and sophisticated, this camp is made up of airy verandas, al fresco showers and private viewing decks; the perfect vantage place from which to enjoy the a dusky desert sunset. As the base for a safari of wonder, Tau Pan is known for its delicious food and panoramic scenery. Your days at Tau Pan Camp will include dusk and dawn game drives into the wilderness where you will see desert lions, leopard and plains game. 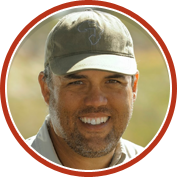 Discover the secrets of the bush on a slow and comfortable walking safari and meet the local San people who have occupied this area of Africa since time immemorial. Retire after your daily adventures with a lap around the pool, or a night of star gazing at the crystal clear skies. Tau Pan is about a return to nature and enjoying the simple pleausures in life. After your restful time at Tau Pan Camp, you'll be transferred back to Maun where a connecting flight will drop you off at the Kwando Splash Camp. Spend the next two days enjoying the secrets of the Okavango Delta, the only of its kind in Botswana. Amid the calls of a multitude of bird song, Splash Camp offers the best of both worlds; watery wilderness and no end to pleasurable activities such as mokoro rides that lap gently over the water, nature walks where you'll get an intimate look at the surrounding landscape and even a sunset cruise on a powerboat where you'll get up close and personal with hippo, elephant and other mammals that come to drink from the life giving waters. Day and night game drives (two per day) will be equally as rewarding. Your gateway to the thrill of tigerfishing also awaits. The last leg of your journey begins. You'll take a short flight to your next location; Kwando Lagoon Lodge in the Linyanti Wetlands. Set on the banks of the wild Kwando river, this tented campis set under the shaded canopy of ebony and marula trees. Picturesque views of the river and permanent watering hole means that you can watch hippo, elephant, Cape buffalo and many other game species as they come down to drink. The acitivties offered at Kwando Lagoon Lodge include day and night game drives (look out for the endangered African wild dog), walking safaris, boat cruises and fishing. Please note that fishing is prohibited during the months of January and February as this is the fish breeding season. Relax and enjoy the natural beauty of this pristine part of the world for two days. Your green season safari has come to an end. You'll be tranferred by short flight back to Maun where your connecting flight back home awaits.